Boron is a naturally-occurring element. It is typically combined with other substances to form borates, including boric acid, salts of borates, and boron oxide. Boron is released naturally into the environment by oceans, volcanoes, and geothermal steam. It is also mined and used by many industries. Borates are used largely to produce glass. Boric acid is used in flame retardants, medicines, pesticides, and wood preservatives. Low-dose exposure can cause respiratory and skin irritation, vomiting, diarrhoea, nausea, and headaches. Borates have not been thoroughly tested for health effects in humans, but the EPA has found potential developmental toxicity (especially on the testes). Borates are considered safer to human health and the environment than other flame retardants (like PBDEs and PCBs) and wood preservatives (like arsenic). 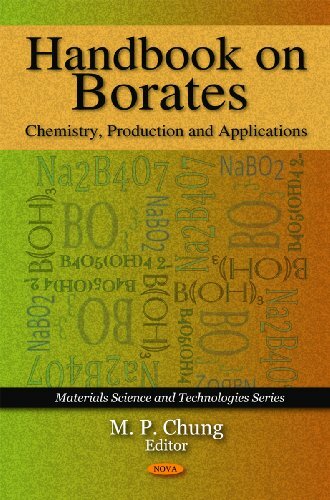 This new and important book gathers the latest research from around the globe in the study of borates with a focus on such topics as: boron-based wood preservatives and their uses, molecular aspects of boron treatment technologies, alkaline earth borates, borate toxicity and effect on drug stability and others.